Family Violence 7 Edition Examines the entire spectrum of family violence, focusing onsocial processes and social relationships. 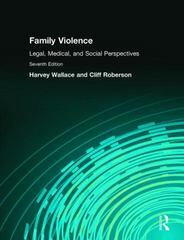 The seventh edition of Family Violence: Legal, Medical, and Social Perspectives by Harvey Wallace and Cliff Roberson is a comprehensive introduction to the study of family violence that guides readers to a better understanding of the challenges involved in reducing or eliminating violence. The six major topics are: domestic partner abuse, child abuse, elder abuse, physical and psychological abuse, identifying when abuse occurs, and discussing the effects of the various types of abuse or violence.Learning GoalsUpon completing this book, readers will be able to:-Understand the facets of family violence.-Discuss how violence may be reduced or eliminated.-Identify how each major type of abuse impacts the social and law enforcement agencies that are involved.